It’s funny, we’re morally compelled to do the best we can to help our dogs if they are ill. Diabetic dogs are a good example of this. The veterinary community has helped us develop a set of safety barriers to prevent the disease from adversely affecting our dog’s. But as you’d expect, our dogs are willing to return the favour. Diabetic humans now benefit from the mind-boggling intelligence and instinctive protectiveness of our pet dogs. One group of people in particular are trail blazing in their dedication to diabetic alert dogs and it’s a fascinating story with a few surprises to boot. Paula D Nunnery reveals the process of taking an ordinary dog and making it a life saver, uncover the myth about how alert dogs detect problems and explain how these incredible dogs are trained while demonstrating how love plays a big part in the life saving work of these dogs. Sugar Dogs International individually assists diabetics and their families in training Poodles as diabetic alert service animals. While there are many training methods for service animals, we offer individualized training on a one-on-one basis via the Internet. We know that what works for one animal may not work for all. Our training method begins by gaining the animal's trust as rescue dogs have often been bounced around or have lost a very nice home (for example, an elderly person dies or becomes too ill to care for them). We begin as if the animal (regardless of age) is a new puppy in the home, with very basic housebreaking and crate training. Starting out with a rescued Poodle as if it is a puppy seems to work well as then the dog will learn the household routine. This method is also used for new Poodle puppies, which may have been purchased from a breeder. We have trained Poodles beginning at three months of age with basic obedience lessons. It is readily apparent if rescued Poodles have had some basic housebreaking training in the past; and, if not, old dogs can learn new tricks. All Sugar Dogs must have obedience training with their diabetic partner. Obedience training helps create the loving bond between the service animal and the diabetic and their family. The more consistent humans are, the easier for the Poodle. Diabetics require a regular routine, regularly checking glucose levels, eating on time, exercising, and this method works with animals as well. We know that other trainers use “bucket training,” which is used by dog trainers to teach dogs to recognize the smell of drugs and/or bombs and alert; however, Sugar Dogs get along better with individualized training to know their diabetic partners and learn to smell the molecular changes in a specific diabetic rather than being trained to alert to dirty laundry (as used in “bucket training”). The diabetic must test their sugars consistently with a bloodletting finger stick device and a glucose meter. While we request that diabetics follow their doctors’ orders, we generally recommend testing before meals and at bedtime. The Poodle is not a substitute for glucose testing. Our premise is that if the Poodle loves you, it will alert. In the beginning, after housebreaking and crate training, a new Poodle is attached by a leash or lead to the diabetic and goes with the diabetic everywhere wearing a service dog “in training” vest. Poodles love to be with their diabetic partners. A fasting blood glucose test. This test is performed after fasting (no food or liquids other than water) for eight hours. A normal fasting blood glucose level is less than 110 mg/dl. A diagnosis of diabetes is made if blood glucose reading is 126 mg/dl or higher after two consecutive blood tests. A "random" blood glucose test taken at any time. A normal blood glucose range is in the low to mid 100s. A diagnosis of diabetes is made if blood glucose reading is 200 mg/dl or higher and the person has symptoms of disease such as fatigue, excessive urination, excessive thirst or unplanned weight loss. These numbers are the same internationally and Sugar Dogs International works with people all over the world. It is just as easy to work with a diabetic next door, as it is a diabetic in India. Currently, many glucose meters are manufactured in the United Kingdom. Many brands of insulin pumps are manufactured in Germany. The Poodle is only ever positively rewarded. We do not subscribe to any negative reinforcement or negative training at all. If the blood sugar is too high, we use an insulin pump or insulin in a syringe (as prescribed by an endocrinologist) to basal the appropriate amount of insulin if the blood sugar is high. If the blood sugar is too low, the Poodle will alert. We teach diabetics and their families how to recognize when the Poodle is alerting. At night during a low blood sugar episode, the Poodle may lick the face of the diabetic and if that does not awaken the person, will scratch vigorously at them until they awaken. The Poodle smells the molecular change, which is not necessarily the breath smell or diabetic halitosis. It sounds too easy, but that is what Sugar Dogs International teaches; however, the diabetic must be consistent with testing. The Sugar Dogs International website is available at www.SugarDogs.org. The training method is revealed to diabetics and their families in stages, to avoid it being overwhelming. Sugar Dogs International desires the training process to be positive to the diabetic, their family and the Poodle. The Board of Directors of Sugar Dogs International, Inc., a Florida not-for-profit corporation, had its initial meeting at Steinhatchee Landing in Steinhatchee, Florida. We enjoyed two of the many different cottages for a lovely weekend. 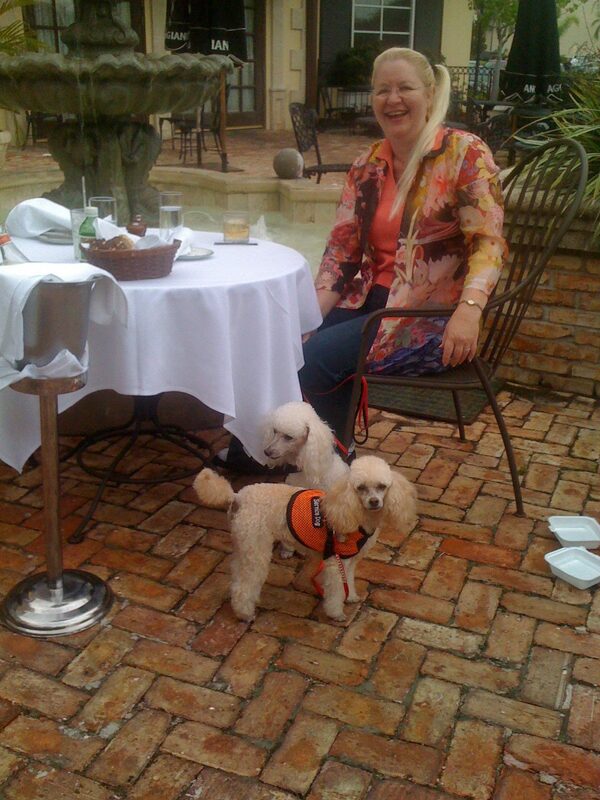 We had brunch at Fiddler’s where the staff and our two Sugar Dogs, Peaches and Sugar Boy, joined us. (Remember that in Florida it is against the law to leave your dog or child in the car unattended.) We had a marvelous time and vowed to return. On Saturday evening, September 12, 2009, Mimi entered Roy’s Restaurant in Steinhatchee, FL and requested a table for three (3) people and two (2) diabetic alert service animals. She offered documentation, proving that the two poodles were service dogs as defined by the Americans with Disabilities Act (ADA) to the white haired lady who seated us. The two poodles in my party on Saturday evening are both lifesavers. Both dogs have been individually trained to perform alert services for insulin dependent diabetics. Therefore, an insulin-dependent diabetic was illegally denied food service during a regular dinner hour by the staff and management of Roy’s Restaurant, Inc. The Complaint was modified by Brooke Henderson and responded to by defence counsel for Roy’s Restaurant, Jennifer Ellison, who drafted Affidavits for four (4) employees who alleged that the dogs were wet, had fleas and smelled bad. In reply, we offered Affidavits and documentation proving that the Poodles receive professional grooming every other week (and had received such care on Friday, September 11, 2010). Additionally, documentation from the Poodles’ veterinarian was offered indicating that both were using a flea preventative regularly, both were recognized as service animals, and that Peaches had been in Focus magazine with her veterinarian, Dr. Jennifer Conner. (a) "Housing accommodation" means any real property or portion thereof which is used or occupied, or intended, arranged, or designed to be used or occupied, as the home, residence, or sleeping place of one or more persons, but does not include any single-family residence, the occupants of which rent, lease, or furnish for compensation not more than one room therein. 1. "Hard of hearing" means an individual who has suffered a permanent hearing impairment that is severe enough to necessitate the use of amplification devices to discriminate speech sounds in verbal communication. 2. "Physically disabled" means any person who has a physical impairment that substantially limits one or more major life activities. (c) "Public accommodation" means a common carrier, airplane, motor vehicle, railroad train, motor bus, streetcar, boat, or other public conveyance or mode of transportation; hotel; lodging place; place of public accommodation, amusement, or resort; and other places to which the general public is invited, subject only to the conditions and limitations established by law and applicable alike to all persons. (d) "Service animal" means an animal that is trained to perform tasks for an individual with a disability. The tasks may include, but are not limited to, guiding a person who is visually impaired or blind, alerting a person who is deaf or hard of hearing, pulling a wheelchair, assisting with mobility or balance, alerting and protecting a person who is having a seizure, retrieving objects, or performing other special tasks. A service animal is not a pet. (e) A public accommodation may exclude or remove any animal from the premises, including a service animal, if the animal's behavior poses a direct threat to the health and safety of others. Allergies and fear of animals are not valid reasons for denying access or refusing service to an individual with a service animal. If a service animal is excluded or removed for being a direct threat to others, the public accommodation must provide the individual with a disability the option of continuing access to the public accommodation without having the service animal on the premises. Lesson #2 learned: Stand Ready, Willing and Able to Call the Local Police or Sheriff’s Department. Roy’s Restaurant would not have “won” the day IF Mimi had called independent witnesses, gotten names and addresses of the people seated near us, etc. On the Sunday before Halloween, 2009, Mimi and the Sugar Dogs joined Darla and James for a wonderful event sponsored by Florida Poodle Rescue, Inc. (FPR): the Poodle Picnic! It was loads of fun for the service animals to have a day off to run and play with their Poodle friends on a 10 acre fully fenced farm. And it gave our newest Sugar Dogs member, Patricia Walker, an opportunity to “shop” for a Poodle to train as a diabetic alert service animal. Pat selected Mozart, a nine or ten year old Poodle that had come to FPR with some health problems that his former family could not handle. He had suffered a slight stroke which left him with muscle weakness in his hind legs and he was toothless. He is part Maltese and part Poodle, solid white. And while his little tongue still hangs out of his mouth, he eats well, has gained weight and now has a forever home with his Mom Pat. He was recently given a clean bill of health by Dr. Jennifer Conner of Animal Wellness Center of Plant City. Pat is a Type 2 diabetic taking an oral agent to control her diabetes. Sweet little Mozart now alerts and is recognized as a diabetic alert service animal. Pat has lost about 25 pounds since October as she walks Mozart several times a day. He arrived housebroken and Pat is fastidious about taking him out. Mozart is now a member of the Social Circle in Temple Terrace, going out to lunch with his diabetic partner, going with her to visit friends and as she makes her rounds in her various social activities including her extensive volunteer work. He’s a beautiful diabetic alert service animal and Sugar Dogs International is proud of him! l am a forty year type 1 diabetic I have many of the problems associated with the deasese. I heard of your sugardogs but no one had any further information at the veterans hospital. I am interested in you program and the dogs. My only medical support is thr Janes A Haley VA hospital. can you assist me in this quest?